One of the earliest and one of best "Screwball Comedy" from the 1930s. Directed by Gregory La Cava and he received a nomination for best directing. 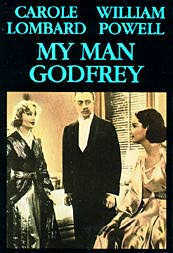 The cast includes: William Powell (Godfrey), Carole Lombard (Irene Bullock), Gail Patrick (Cornelia Bullock), Alice Brady (Mrs. Bullock), and Eugene Pallette (Mr. Bullock).